So what is emotional intimacy? Real intimacy takes time to establish. It involves trust and mutually feeling safe to be vulnerable, allowing healthy self-disclosure without fearing being betrayed or misunderstood. It involves respect, tolerance, and always sharing how you feel—no secrets. In a truly intimate relationship, you will feel safe, loved, appreciated, and emotionally supported. Emotional intimacy is about knowing the good, the bad, the silly, and the ugly and loving each other anyway, unconditionally. It’s about having each other’s backs. A healthy, long-term relationship can never be achieved without real intimacy. Emotionally unavailable people are protecting their heart. They create barriers to keep others at a safe distance so that they can feel safe. They create a false front to hide their inner feelings: the pain of having been hurt or the fear of being hurt—many times both. The Intimacy Struggle is a quick read that bottom lines where your intimacy issues come from and how to push past them to experience happier relationships. Someone who is truly emotionally available isn’t interested in someone who is unavailable. If you have been through a recent breakup or other difficult time, then temporarily being emotionally unavailable is understandable, even necessary. It’s wise to take time to heal, self-reflect, and hopefully grow. But if a past traumatic event or heartbreak is causing you to fear being hurt again, it is going to require some courage to open your heart to find true love. If you never learned how to be emotionally available as a child, you’ll have to decide if you’re willing to try now. To be emotionally available is to be willing to offer your whole self and to explore and accept your partner’s whole self. If your heart rate is starting to go up and you’re feeling uncomfortable at just the thought of doing that, then take a few deep breaths. Any kind of change is always a process, so don’t pressure yourself to become emotionally available overnight. You can do it in small steps, one day at a time. Make a conscious choice to decide you want to be emotionally available. Get in touch with yourself. Before you can share your feelings, you have to know what they are. Trust yourself. Trusting others is not as important as trusting yourself. You can never control what someone else does. When you truly trust yourself, you will be able to trust others; because if they do fail you, you’ll know you will be okay. Allow yourself to be emotionally vulnerable. You could be rejected or misunderstood. But you could also achieve real intimacy, and love like you have never known it before. Share yourself with your partner. Mutually share your deepest feelings, goals, and fears. It may be scary at first, but as your partner learns more about you and loves you anyway, it will become increasingly easy to just be yourself. Spend quality time together. Use that time to share your thoughts and feelings. By allowing yourself to be emotionally available, you’ll be able to judge another’s availability. It takes wisdom and some practice to know when to reveal things about yourself and how much to reveal in a new relationship. 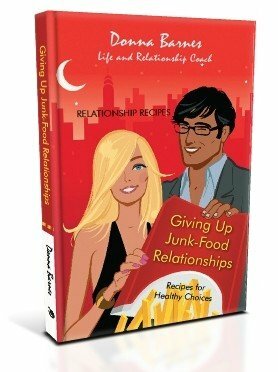 The “Healthy Boundaries” section of Giving Up Junk-Food Relationships will help you set a healthy pace. Make a choice to let go of any partner who doesn’t welcome, embrace, and return your healthy vulnerability. Anyone who doesn’t appreciate your emotional intimacy doesn’t deserve your physical intimacy.